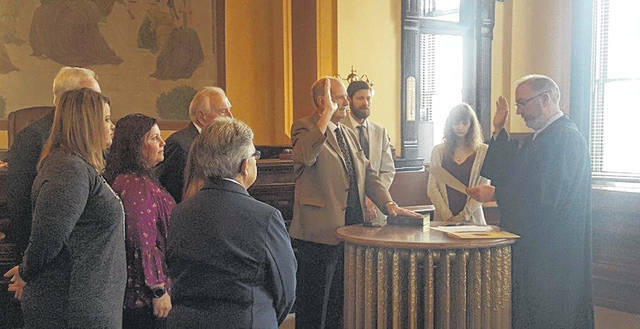 Fayette County Court of Common Pleas Judge Steven Beathard recently swore in Jerry Savage as the new Fayette County Veterans Service Commissioner. He will take over the position of Charles “Buck” Harris, who passed away in July. Jerry Savage was sworn in by Fayette County Court of Common Pleas Judge Steven Beathard to serve as the Fayette County Veterans Service Commissioner. Savage was born in Adams County, where he grew up on a dairy farm and graduated from Peebles High School. Before he decided on serving veterans, Savage was in education for years where he taught both math and science and served as a principal for East Clinton and Wayne High in Huber Heights. He ended as the “Content Area Supervisor,” where he was in charge of all educational curriculum in Huber Heights; which was the 11th largest school district at the time. Savage retired from public education with a master’s degree with a little over 35 years of experience. He also served as head basketball coach at Shawnee High School. Savage — who also served in the United States Air Force from 1967 to 1971 — is additionally a lifetime VFW member, a member of the American Legion and recently became a new member of the Fayette County Honor Guard, something he said he is very honored to be a part of. He is the replacement of Charles “Buck” Harris, who passed away in July after a battle with cancer. According to a press release from the veterans service commission, Savage said he came to Fayette County looking for a new home and it happened to be a 30-minute drive to work when he was a principal at East Clinton. He said he also felt that he had a sense of purpose to help the many veterans in need, and knew he could make a difference in their lives. Savage will take over the “Member at Large” position, which is set aside for a person who does not represent or belong to any specific organization. Other commission members include Disabled American Veterans member Robert L. Malone, American Legion member Eddie Fisher, AMVETS member John Mason and VFW member Eddie J. Wynne. https://www.recordherald.com/wp-content/uploads/sites/27/2019/01/web1_part0-002-.jpgFayette County Court of Common Pleas Judge Steven Beathard recently swore in Jerry Savage as the new Fayette County Veterans Service Commissioner. He will take over the position of Charles “Buck” Harris, who passed away in July.